I work with people and code to create the most amazing documentation for our products. This is the first working, demo-able version of a product that is under heavy development. This is not a production-ready component yet. Its API will still change (we will do some major refactoring in iteration 2). It works best in Chrome, seems to work fine in Safari and works well in Firefox with the exception of lack of selection change listener (we will add full support for other modern environments in iteration 3). It has bugs (we will work on its stability in iteration 3). It has no mobile support (research is ongoing and multiple other UX/UI aspects are researched). It has no documentation (actually, there are complete API docs in-code and some guides, but lots of outdated ones; we will work on this in iteration 2). Accessibility support will be added later. More features will come as soon as the API stabilizes (after iteration 2). The code has 100% test-coverage and we manage technical debt at a low level (the entire iteration 2 is about refactoring, too). We kept all the designs public, being open to the community throughout the whole time. We implemented an amazing editing engine which allowed us to create these great hackathon features in 2 days and which supports collaborative editing. We created a highly extensible and flexible architecture which consists of an editing framework and editing solutions that will be built on top of it. We built a great, fully-committed team of fantastic developers around the project and hope to further collaborate with the community in its future development. We have a clear roadmap to cover all the “missing” points from the list above – and many, many more – so stay tuned! We created a basic sample that you can play with. 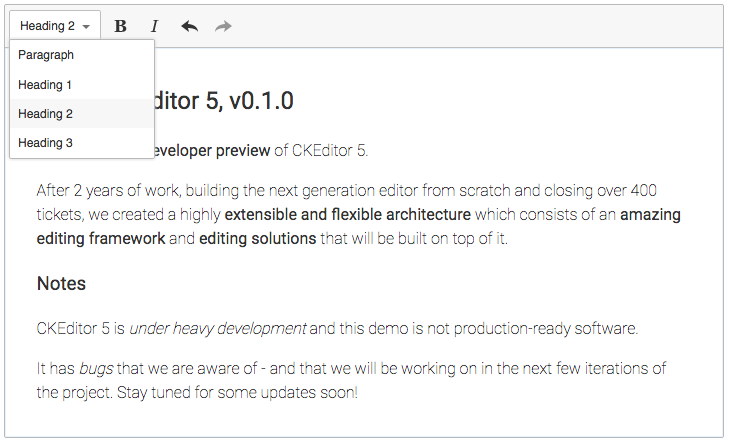 Check out the developer preview of CKEditor 5 (version 0.1.0) on the CKEditor 5 GitHub.io page. Great performance, reliability, and quality. Modern design based on ES6, clear MVC patterns, npm and all fancy 3-letter acronyms. Redesigned architecture, with focus on feature granularity and extensibility. Targeted to browsers and applications used in desktops and mobile devices. New data model with abstract syntax tree and support for Operational Transformation. New editing engine with support for collaborative editing, tracking changes, annotations, with powerful API making it easy to develop complex features. Various data formats supported (HTML, Markdown, Wiki Markup etc.). Feel free to refer to our Medium publications for more information about the CKEditor 5 project, technical details, the future of rich text editing and how to fix contenteditable or our thoughts on working on Open Source software. Cleanup, refactoring and API stabilization. Code and project structure refactoring. Stabilization of the project in terms of the API to allow for more rapid feature development. Reviewing existing documentation and creating architecture documentation. Fixing most important issues in existing features. Compatibility with other browsers (so far CKEditor 5 was tested only in Chrome). Note: CKEditor 5 implements a multi-repo architecture, so the milestones are defined separately in each repository. As mentioned before, CKEditor 4 and CKEditor 5 are two separate projects, with two development teams working on them simultaneously. Nothing has changed in this regard — CKEditor 4 has its own roadmap, with plenty of exciting new features coming soon. We are most excited about the project and would love to get some feedback about this early preview. You can report all general issues in the main CKEditor 5 repository. Specific issues, like those related to the editing engine, should be reported in their respective repositories. Very general ideas and questions can be reported in the design repository.